April 24 , by Mardi Robyn. Aren’t these earrings lovely? I think so! I like crochet jewelry. I do not know how to crochet but, my Mama does. I have a stash of hoop earrings waiting to be used, and my Mama has the yarn, I can’t wait to show her this tutorial. 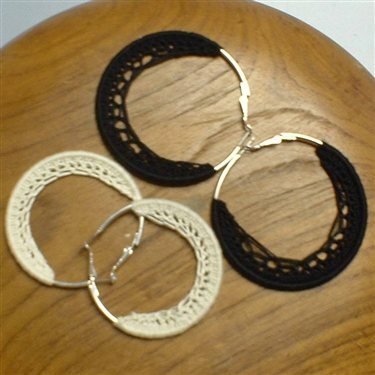 You can purchase hoop earrings two or three to a pack in most retail stores that sell jewelry. If you have a local jewelry dollar store like we have here in Mississippi, you can purchase a card of various size earrings, usually four or five to a pack, of course for a dollar. If you do not have a dollar jewelry store, your local dollar store might have a display of cheap jewelry you could use, or you can always find wholesale hoop earrings at discount prices online at websites like Etsy and Ebay. Pair them with your favorite yarn, and follow the pattern on the Crochet Me website and you will have yourself a beautiful pair of Lacy Crocheted Earrings. Check it out!